We previously demonstrated that the phase of oscillations modulates neural activity representing categorical information using human intracranial recordings and high-frequency activity from local field potentials (Watrous et al., 2015b). We extend these findings here using human single-neuron recordings during a virtual navigation task. We identify neurons in the medial temporal lobe with firing-rate modulations for specific navigational goals, as well as for navigational planning and goal arrival. Going beyond this work, using a novel oscillation detection algorithm, we identify phase-locked neural firing that encodes information about a person’s prospective navigational goal in the absence of firing rate changes. These results provide evidence for navigational planning and contextual accounts of human MTL function at the single-neuron level. More generally, our findings identify phase-coded neuronal firing as a component of the human neural code. Single-neuron firing forms a fundamental basis of the neural code during perception and memory. In addition to the well-established role for behavior-related changes in neuronal firing rates, converging evidence across species and behaviors suggests that interactions between single-neuron spike timing and oscillations observed in the local field potential (LFP) also contribute to the neural code (Hyman et al., 2005; Huxter et al., 2003; Rutishauser et al., 2010; Belitski et al., 2008; Ng et al., 2013; Kayser et al., 2009). In rodents, hippocampal and medial prefrontal cells show phase precession relative to theta oscillations during navigation (O'Keefe and Recce, 1993; Terada et al., 2017; Jones and Wilson, 2005), in which the theta phase of neuronal firing represents information about the animal’s position (Jensen and Lisman, 2000). These observations have been incorporated into theoretical models of neural coding that hypothesize a general role for oscillatory phase for coding various types of behavioral information (Nadasdy, 2009; Kayser et al., 2012; Lisman and Jensen, 2013; Watrous and Ekstrom, 2014). For example, in Spectro-Contextual Encoding and Retrieval Theory (SCERT), we proposed that frequency-specific and phase-locked neuronal firing to low-frequency oscillations at different phases (i.e. phase coding) also forms a basis of the human neural code (Watrous and Ekstrom, 2014; Watrous et al., 2015b). We previously reported evidence for SCERT (Watrous et al., 2015a) using high-frequency activity in the LFP as a proxy for single-cell spiking (Crone et al., 1998; Manning et al., 2009; Miller et al., 2014). However, given the complex and variable relationship (Ekstrom et al., 2007; Manning et al., 2009; Rey et al., 2014) between the spiking of particular single neurons and high-frequency activity in the human medial temporal lobe (MTL), it is unclear whether human MTL neurons show phase coding of navigationally relevant information beyond an overall preference to fire at particular phases (Jacobs et al., 2007). We thus sought to extend our previous findings of LFP phase coding (Watrous et al., 2015a) to the single-neuron level in patients performing a virtual navigation task, hypothesizing that phase coding would occur to low-frequency oscillations based on both human studies (Jacobs et al., 2010; Watrous et al., 2011; Ekstrom et al., 2005; Mormann et al., 2008) and the above-described rodent work. An optimal navigator must both plan routes and recognize when they have arrived at their destination. Human imaging and lesion evidence indicate that activity in the human MTL and medial prefrontal cortex forms active representations of spatial context such as navigational goals (Ranganath and Ritchey, 2012; Brown et al., 2016; Ciaramelli, 2008; Spiers and Maguire, 2007; Wolbers et al., 2007) in support of navigational planning (Horner et al., 2016; Bellmund et al., 2016; Kaplan et al., 2017). Analyzing human single-neuron recordings from the MTL, previous studies have identified neurons that increase their firing rate when viewing goal locations (Ekstrom et al., 2003). To date, it is unclear whether phase-coding also exists for navigational goals. It is also unknown whether rate and phase-coding co-exist in humans, as suggested by rodent studies that indicated that phase coding was a distinct phenomenon compared to rate coding (Huxter et al., 2003; Hyman et al., 2005). Drawing upon the phase-coding hypotheses from SCERT and related findings in rodents (Hollup et al., 2001; Hok et al., 2007; Hyman et al., 2005; O'Neill et al., 2013), we hypothesized that spatial contextual representations for specific navigational goals would be implemented by distinctive patterns of phase coding by individual neurons. Moreover, based on rodent (Wikenheiser and Redish, 2015) and human studies (Viard et al., 2011; Howard et al., 2014; Brown et al., 2016; Horner et al., 2016; Bellmund et al., 2016) implicating medial temporal lobe structures and frontal cortex in navigational planning, we reasoned that spike-phase coding may support these behaviors at the single-neuron level, hypothesizing that distinctive spike phase patterns would correspond to the neural network states representing planning and searching for particular goals. SCERT generally predicts that oscillatory frequencies should match between encoding and retrieval and that phase coding should occur at the dominant oscillatory frequency that occurs in a particular behavior and brain region. Thus, based on the body of evidence indicating hippocampal slow-theta oscillations are the most prominent during human virtual navigation (Ekstrom et al., 2005; Watrous et al., 2011; Jacobs, 2014; Bush et al., 2017), we predicted here that phase coding should occur primarily at slow theta frequencies. To test these ideas, we analyzed a dataset that simultaneously measured human single-neuron and oscillatory activity from MTL (hippocampus, entorhinal cortex, amygdala, and parahippocampal gyrus) and frontal (medial prefrontal/cingulate, motor, orbitofrontal) regions during a goal-directed navigation task (Figure 1—figure supplement 1; Jacobs et al., 2010; Miller et al., 2015). After first assessing changes in firing rate related to goal activity, we then asked if additional goal-related information is encoded by considering oscillatory phase during spiking. Following the analytic strategy from our previous work (Watrous et al., 2015a), we tested for frequency-specific phase locking and then directly tested for phase coding, which would appear as individual neurons that spiked at different phases according to the prospective goal. In addition to cells that encode navigational variables using firing rate, our results confirmed the existence of phase coding for navigational goals in individual neurons, thus providing the first evidence for the oscillatory phase coding of spatial contextual information in the human brain. Patients performed a goal-directed navigation task in which they moved throughout a circular environment delivering passengers to one of six goal locations located on the outer edge of the environment (see Jacobs et al., 2010 for details). Upon arriving at a goal store, the patient paused and then was instructed to navigate to a new goal store. On each trial, patients thus had to make a navigation plan about which direction of movement in the environment would lead them most directly to the location of their goal. Driving time between stores significantly decreased throughout the task session (Kruskal-Wallis test across sessions, p=0.007), indicating that the patients successfully learned the environment and planned efficient paths between stores. Previous work in humans has identified single neurons responsive to navigational goals (Ekstrom et al., 2003) and imaging work suggests that the MTL is involved in navigational planning ( Bellmund et al., 2016; Horner et al., 2016; Brown et al., 2016). We investigated the single-neuron correlates of these phenomena in our task. 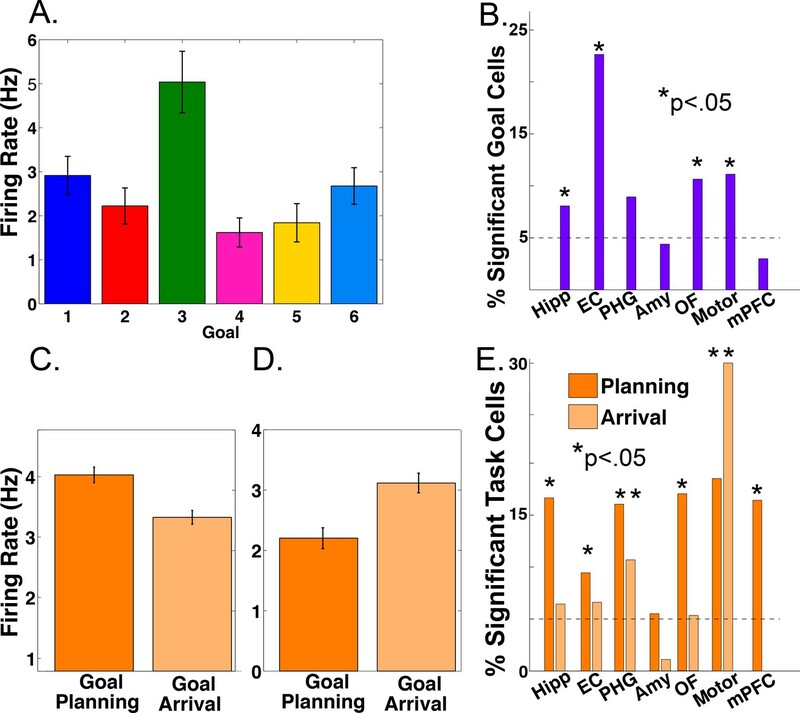 We assessed neuronal firing rate as a function of the identity of the navigational goal and of different task periods using a two-way ANOVA, with factors for goal and task period (‘planning’ vs. ‘arriving’, see Materials and methods). Figure 1A shows an example entorhinal neuron who’s firing significantly increased during deliveries to goal store 3 (main effect of goal, p<0.0001). We identified 53 such goal-responsive cells (11% of 466 MTL neurons; main effect of goal, p<0.05), which were present in 11 of 12 patients. We observed significant counts of goal-responsive neurons in the hippocampus, entorhinal cortex, orbitofrontal cortex, and premotor cortex (Figure 1B; Binomial tests, p’s < 0.05). Firing rate modulations by navigational goal and task phase. (A) Neuron from the entorhinal cortex of patient four whose firing rate was significantly goal-modulated when delivering to goal 3 (p<0.001). Firing rate is plotted as a function of each navigational goal (error bars indicate s.e.m.). (B) Proportion of goal-responsive neurons in each brain area. Asterisk indicates significant counts using binomial test. (C) Example neuron from the hippocampus of patient 12 whose firing rate was modulated during goal planning (p<0.0001). (D) Example neuron from the parahippocampal gyrus of patient eight whose firing rate was modulated during goal arrival (p=0.0002). (E) Proportion of task-responsive neurons in each brain area, shown separately for planning and arrival. See methods for region acronyms. We also identified cells that showed significantly enhanced firing during either the navigational planning or the arrival period of each trial (main effect of task period, p<0.05). Figure 1C shows an example hippocampal neuron whose firing rate significantly increased during navigational planning compared to goal arrival (main effect of task period, two-way ANOVA, p<0.0001, followed by post-hoc analysis). We observed significant counts of navigational planning neurons in the hippocampus of 9 of 12 patients and in all areas except the amygdala (Figure 1E; Binomial test, p<0.05). Furthermore, we observed modulation of firing rate by arrival at goals in parahippocampal and motor areas (Figure 1D–E). We found 24 cells with significant interactions between goal and task period (p<0.05). These results provide single-neuron evidence that the MTL encodes information about navigational goals, and supports navigational planning towards reaching these goals, using modulations in firing rate, extending previous findings (Ekstrom et al., 2003; Watrous et al., 2011; Brown et al., 2016). Our primary hypothesis was that human MTL neurons encode behavioral information by modulating their spiking based on the phase of slow oscillations beyond changes in firing rate. Examining this hypothesis required that we accurately identify the presence and phase of slow oscillations, particularly because human MTL oscillations are lower frequency and less stationary compared to the stable theta oscillations observed in rodents (Watrous et al., 2013; Vass et al., 2016). We developed and benchmarked a novel method, the Multiple Oscillations Detection Algorithm (‘MODAL’; Figure 2A–C), to detect and characterize neural oscillations in adaptively identified band(s) whose frequency ranges are customized for each recording site according to its spectral properties. MODAL identifies narrow-band oscillations exceeding the background 1/f spectrum (Figure 2A) and calculates the instantaneous phase and frequency of oscillations in each band (see Materials and methods) while excluding time points without oscillations or that exhibited epileptogenic activity (Gelinas et al., 2016). Thus, MODAL allowed us to test for phase coding of spikes during the presence of narrowband oscillations in our dataset. Multiple Oscillation Detection Algorithm (‘MODAL’). (A-C) Key steps in the algorithm, shown for an example electrode from the right hippocampus of patient 9. (A) Mean log power averaged over time (black) and a fit line of the 1/f background spectrum (gray). A slow theta band (blue) and a beta band (green) are identified as contiguous frequencies exceeding the fit line. (B) Example output from MODAL depicting a raw trace example of the LFP (upper) with the detected oscillations in each band (lower). The instantaneous frequency of the detected oscillation in each band is overlaid on a spectrogram and gray portions of the spectrogram indicate power values exceeding a local fit (similar to A but using a 10 s epoch). (C) Accumulating detections over time reveals the prevalence of oscillations at each frequency on this electrode (black). Blue and green bars indicate the overall prevalence of oscillations in each frequency, independent of the exact frequency within a band. (D) Population data for MTL channels demonstrating low frequency oscillations. Grey line indicates the percent of LFP channels with a detected band as a function of frequency. Of those channels with a detected band, the black line indicates the average amount of time each frequency was detected. Slow theta oscillations (below 5 Hz) are observed using both metrics. MODAL reliably identified oscillations at multiple frequencies that were visible in the raw trace (Figure 2B–C). Analyzing each of 385 LFP channels from the MTL across the entire task period using MODAL, we found that most channels showed a band of activity centered at ‘slow theta’ (~3 Hz; 93% of electrodes; Figure 2D, gray line). Analyzing the overall amount of time each frequency was detected on these electrodes, we found that slow theta was detected most often (Figure 2D, black line). Similar results were identified in different brain areas (Figure 2—figure supplement 1). We then verified that MODAL can capture multiple narrowband oscillatory signals using a published rodent recording dataset (Fujisawa et al., 2008; crcns.org PFC-2 dataset), and observed canonical rodent hippocampal CA1 theta oscillations and a more variable low-frequency rhythm in the medial prefrontal cortex (Figure 2—figure supplement 2). These results indicate that MODAL is able to identify and track the dynamics of narrowband signals, providing cross-validation for our human findings which are consistent with previous work showing the prevalence of slow theta in the human MTL (Watrous et al., 2011, 2013; Vass et al., 2016; Jacobs, 2014; Bohbot et al., 2017). We subsequently restricted our analysis of phase coding to this low-frequency band (1–10 Hz) because it was most prominently detected by MODAL and because activity in this band has been shown to modulate human single-neuron firing (Jacobs et al., 2007). As a precursor to testing for phase coding, we asked if phase coordinated the activity of individual neurons across the entire task session in the bands identified by MODAL. Focusing first on the MTL, we analyzed 466 neurons that each had a simultaneously recorded LFP with an oscillation in a low-frequency band (1–10 Hz). In many cells we observed significant phase-locking, an overall tendency for firing to increase at particular phases of the LFP oscillation (Jacobs et al., 2007; Rey et al., 2014). Phase locking is evident by examining the LFP phase distribution for all spikes that occurred during oscillations from a given cell (Figure 3A upper panel, Rayleigh p<0.005). Across our population of MTL neurons, we identified phase-locked neural firing in 144 neurons (144/466, 30%, Rayleigh test, p<0.005), a proportion significantly above chance (Binomial p<0.00001). We observed that phase locked neural firing was clustered just after the trough of the oscillation for these cells (Figure 3B, Rayleigh test p<0.00001) and most phase locking occurred to slow-theta oscillations below 5 Hz (Figure 3C). Significant counts of phase-locked neurons were observed in each brain region (Binomial test, p<0.0001) and we observed phase-locking most prominently in the hippocampus (Figure 3D). These results confirm the presence of phase-modulated neuronal activity in this dataset. Phase-Locked Neural Firing to low-frequency oscillations. (A) Spike-triggered average of a phase-locked neuron from the right hippocampus of Patient 1 (left). Red tick mark denotes a spike. Circular histograms (right) show phases at which spikes occurred relative to two detected bands. Spiking was phase-locked to the ascending phase in the 1.5–5 Hz band (red) but not in the 7.5–9 Hz band (Rayleigh test, p=0.004 and p=0.34, respectively). (B) MTL Population data: Pooling over frequencies, mean spike phases were significantly clustered near the initial ascending phase of the oscillation (Rayleigh test, p<0.00001). (C) Population scatter plot of the mean phase of firing and maximally detected frequency within the band for each phase-locked MTL neurons. (D) Population results showing proportion of phase-locked neurons in each brain region. Total bar height indicates the proportion of neurons recorded on an LFP channel with a band in the 1–10 Hz range. See methods for region acronyms. The SCERT model predicts that neuronal activity is modulated by oscillations at particular frequencies. Because the LFPs associated with 44 neurons displayed oscillations at two distinct frequency bands in the 1–10 Hz range, we were able to test if the spike–LFP phase locking was specific to an individual frequency band or present for both bands. 13.6% of these cells (6/44) showed frequency-specific phase locking, showing phase-locked firing in only one LFP frequency band (Figure 3A; p<0.005 in one band, p>0.1 in all other bands). In the remaining cells, 75% did not show phase-locking to any band (n = 33) or showed phase-locking to both bands (n = 5). Thus, extending previous findings (Jacobs et al., 2007) by examining phase-locking to adaptively-identified narrowband signals, we find that human neuronal firing can be modulated by the phase of low-frequency oscillations in a band and frequency-specific manner, as predicted by several models of neural coding (Cohen, 2014; Kayser et al., 2012; Lisman and Jensen, 2013; Watrous and Ekstrom, 2014). To understand the behavioral relevance of phase-tuned neuronal activity, we tested whether neurons also used phase-tuned neural firing to encode spatial contextual information, analogous to the phase coding for location in the rodent hippocampus (O'Keefe and Recce, 1993). Our task tapped into goal-directed navigation and we therefore hypothesized that phase coding may be used to represent the patient’s prospective navigational goal and should appear as neuronal firing to different phases for different navigational goals. Visual inspection of raw traces (Figure 4—figure supplement 1) and circular histograms of spike-phases during deliveries to each goal revealed that this pattern was evident in individual neurons (Figure 4A–B). Spike–Phase coding for navigational goals. (A) Example neuron from the right hippocampus of patient one showing significant spike-LFP phase coding for goal four compared to goals 5 and 6. Circular histograms show spike counts separately for different goals. Black line at center of each plot shows the resultant vector and the colored arc indicates the 95th percentile confidence interval of the circular mean. (B) Example cell from left entorhinal cortex of patient six showing phase coding for goal 6. (C) Population summary showing the proportion of significant neurons in each region that showed rate coding, phase coding, or both effects. Pooling over regions, we observed significant phase coding in 10% of cells. LEC: Left entorhinal cortex; RH: Right hippocampus. We used a cross-validated decoding approach (Watrous et al., 2015a; see Materials and methods) to confirm that goal-specific phase variations were robust, by testing whether the patient’s prospective goal could be predicted from the phase of neuronal spiking. This analysis identified 63 cells (10% of 627 cells tested) across all regions that showed individually significant decoding of goal information from spike phases (p<0.05, shuffle corrected). This proportion of neurons exceeded chance levels (Binomial test, p<0.0001) and spike phase coding differentially occurred in the hippocampus (χ2(6)=50, p<0.0001), with 28 of the phase coding cells coming from the hippocampus of nine different patients (Figure 4C). Roughly half (29/63) of phase coding cells exhibited significant phase-locking (Rayleigh test, p<0.005), consistent with the idea that phase-locking and phase coding are related but non-identical phenomena (Watrous et al., 2015a). Critically, 51 (80%) of the cells that showed significant phase coding did not show firing-rate effects (two-way ANOVA, p>0.1), indicating that phase coding for a specific goal state can exist independent of firing rate effects. We also observed intriguing examples of neurons that showed rate and phase-coding for different goals (Figure 4—figure supplement 2). These results indicate that rate and phase coding each contribute to the neural representation of goals during navigation. To further understand hippocampal phase coding and motivated by our findings of differential firing rate modulation during planning and arrival, we investigated if phase coding differentially occurred during different task periods. Observing such a distinction would indicate that phase coding for goals is behaviorally relevant because the effects relate to navigational planning or goal arrival. We thus re-ran our decoding analysis for hippocampal neurons and restricted the analysis to either planning or arrival periods of each trial. We identified a subset of 24 hippocampal neurons that showed significant decoding (p<0.05) during the planning period, a proportion significantly above chance (24/186 neurons, 12% Binomial test p<0.00001, chance = 9.3 neurons). Similarly, we identified a mostly distinct subset of neurons (e.g., Figure 4—figure supplements 1 and 2) that showed phase coding during goal arrival (24/186 neurons, 12%, Binomial test p<0.00001). Importantly, these were largely distinct subsets of hippocampal neurons and were found in different patient groups, with only two neurons significant for both planning and arrival. Because we imposed two statistical thresholds per cell for inclusion, this analysis is statistically more stringent than the preceding analysis, which assessed phase coding over the entire task period, and thus the neuron counts are expected to be substantially smaller. Although our primary analysis focused on phase coding to low-frequency (1–10 Hz) oscillations because they were most prevalent in the hippocampus, we also examined whether phase coding was present at the sites that showed alpha- or beta-band oscillations (10–30 Hz). However, we did not observe phase coding beyond chance levels in this population of hippocampal cells in this band (5.2%, n = 7 of 133 neurons, chance = 5%). In sum, we find evidence that phase-coding by individual neurons is specific to particular task periods and frequencies. We conclude that phase coding occurs in distinct hippocampal populations in support of navigational planning and goal arrival. More broadly, these findings suggest that phase-based coding to slow oscillations is a general phenomenon used by MTL neurons to represent contextual information. We performed several control analyses to exclude alternate accounts of our findings (see Control Analyses section for full details). Average firing rates did not differ between phase-coding and non-phase-coding cells (ranksum test, p=0.39). Phase coding was not related to the overall prevalence of oscillations detected by MODAL (rho = −0.0049, p=0.9) nor to oscillatory bandwidth (rho = 0.008, p=0.85). The prevalence of oscillations was not modulated as a function of goal in the vast majority (94%) of phase-coding cells. These results indicate that phase coding for goals is more directly related to coupling between spikes and the LFP than to broader changes in LFP power or spike rates. Finally, to link these findings to our previous work using high-frequency activity (Watrous et al., 2015a), we observed a significant positive relationship (shuffle corrected p<0.01) between single-neuron firing rate and high-frequency activity in 41% of recorded neurons, suggesting that the phenomena are related in many cases. We thus conclude that phase coding is a robust mechanism for neural representation in the human brain during navigation. Analyzing recordings from epilepsy patients performing a goal-directed navigation task, we expand our previous observation of phase-coding with high-frequency LFPs (Watrous et al., 2015a) to the domain of single neuron spiking. In addition to firing rate modulations (discussed below), we found a distinct population of ~10% of cells in which spike-LFP phase coding contributed to representations in the absence of significant changes in firing rate (Hyman et al., 2005; Rutishauser et al., 2010). In addition, we found neurons that were phase-locked to frequency-specific narrowband oscillations primarily in the slow-theta band. Together, these findings provide new, stronger evidence for SCERT and related models that posit a role for oscillatory phase in neural coding (Nadasdy, 2009; Kayser et al., 2012; Lisman and Jensen, 2013; Watrous and Ekstrom, 2014). We replicated the earlier finding of firing-rate coding of goal representations in human single-cell activity (Ekstrom et al., 2003) and provide novel evidence for MTL and medial prefrontal neuronal firing during navigational planning (Figure 1E). Consistent with its role in viewpoint-dependent scene processing (Epstein et al., 2003), we found neurons in parahippocampal gyrus that were modulated during navigational arrival. In our analysis of goal modulation, we identified a similar number of neurons that were rate-modulated (n = 53) or spike-LFP phase modulated (n = 63) and these were largely non-overlapping neuronal populations. Phase-coding also appeared to be modulated by current task demands such that it appeared during either navigational planning or goal arrival. Because different groups of cells show rate versus phase coding for goals, it indicates that these phenomena are partially distinct (Huxter et al., 2003) and that phase coding is not an epiphenomenon. Our analyses benefited from employing the MODAL algorithm, which combines features of earlier algorithms (Whitten et al., 2011; Lega et al., 2012; Cohen, 2014) to identify oscillatory bands in a manner that is customized for each recording site. MODAL is an improvement on these methods because it adaptively identifies oscillatory band(s) without introducing experimenter bias regarding bands of interest, excludes periods when phase is noisy because oscillations are absent, and provides exactly one estimate of power, phase, and frequency per band and timepoint. We focused on low-frequency oscillations in this study due to the nature of our task, but it should be understood that MODAL allows one to investigate oscillatory effects such as phase-coding at higher frequency bands such as beta or gamma (Siegel et al., 2009; Colgin, 2016). Prior work has argued that the unstable shifts in gamma frequency limit their utility in phase coding (Xing et al., 2012). This is likely distinct from phase coding at slow frequencies in which both modeling (Cohen, 2014) and empirical studies (Hutcheon and Yarom, 2000; Giocomo et al., 2007) support the idea that neurons may respond maximally to inputs at particular frequencies, likely manifesting as the aggregated LFP signal (Buzsáki et al., 2012). Our findings provide the first evidence of phase coding during human navigation and provide a theoretically important link to other model systems where phase coding is present (Siegel et al., 2009; Kayser et al., 2009; Turesson et al., 2012; Ng et al., 2013), such as phase-precession (O'Keefe and Recce, 1993; Terada et al., 2017). However, we also found prominent phase-locking and phase-coding to slower frequency oscillations below 5 Hz, suggesting that phase coding exists beyond the canonical 8-Hz theta signal seen in rats. These findings thus lend further credence to findings indicating that (virtual) navigation-related theta occurs at a slower frequency in humans (Watrous et al., 2013; Jacobs, 2014; Bohbot et al., 2017) and demonstrates that these oscillations play a functional role in modulating neuronal spiking. Epilepsy is marked by slowing of neural oscillations which might be considered a confound in the present study. However, numerous previous studies have identified ~3-Hz oscillations in the human MTL (Mormann et al., 2008; Watrous et al., 2011; Lega et al., 2012; Bush et al., 2017), some of which had removed electrodes from the seizure onset zone or had analyzed intracranial recordings from non-epileptic patients (Brazier, 1968). We thus conclude that the present results would generalize to healthy populations. These results align with work implicating the human MTL in spatial contextual representation (Ranganath and Ritchey, 2012) of navigational goals (Ekstrom et al., 2003; Watrous et al., 2011; Brown et al., 2016). Our results provide further evidence that the timing of MTL activity is critical for behavior (Reber et al., 2017; Rey et al., 2014). We speculate that the goal coding observed in this study reflects flexible coding of spatial contextual information in the service of ongoing behavior (Warren et al., 2012; Yee et al., 2014). Consistent with this interpretation, we observed cells that were phase coding either during navigational planning or goal arrival. Combined with previous human studies (Kraskov et al., 2007; Lopour et al., 2013; Watrous et al., 2015a; ten Oever and Sack, 2015), our work indicates that both firing rate and the precise timing of activity relative to LFP phase are general coding mechanisms in the human MTL across behaviors and tasks, suggesting that other types of contextual information may also be encoded using LFP phase. Future studies can build off these findings to directly assess phase coding of other types of contextual information in humans, such as phase-precession to space or time. We analyzed data from 12 patients with drug-resistant epilepsy undergoing seizure monitoring (surgeries performed by I.F.). The Medical Institutional Review Board at the University of California-Los Angeles approved this study (IRB#10–000973) involving recordings from patients with drug-resistant epilepsy who provided informed consent to participate in research. Patients were implanted with microwire depth electrodes (Fried et al., 1999) targeting the medial temporal lobe and medial frontal lobe sites (Figure 1—figure supplement 1, see Jacobs et al., 2010; Fried et al., 1999; Mukamel et al., 2010 for other example implantation images). Groups were formed for recordings in hippocampus, entorhinal cortex, parahippocampal gyrus, amygdala, orbitofrontal, (pre) motor, and cingulate/medial prefrontal cortex. (n = 282, 176, 68, 225, 200, 82, 137 neurons, respectively). Acronyms for these regions are Hipp, EC, PHG, Amy, OF, Motor, and mPFC, respectively. Subsets of these neurons were analyzed depending on the inclusion criteria for each specific analysis. For instance, only neurons with simultaneously recorded LFPs exhibiting 1–10 Hz oscillations were analyzed for phase locking and phase coding. Microwire signals were recorded at 28–32 kHz and captured LFPs and action potentials, which were spike-sorted using wave_clus (Quiroga et al., 2004). Signals were then downsampled to 2 kHz. We examined data from a total of 31 recording sessions in which patients performed a continuous virtual-taxi driver game in a circular environment. Patients were instructed to drive passengers to one of 6 goal stores in the virtual environment. Upon arrival, they were given a new goal destination. The task was self-paced in order to accommodate patient testing needs and therefore patients performed at ceiling. Patients performed an average of 73 deliveries in each session (standard deviation = 11 deliveries). To assess behavioral performance, we calculated the drive time for each delivery, defined as the amount of time to drive between goal stores. We binned each task session into quintiles and calculated a Kruskal-Wallis test across task sessions. The recordings and behavioral task have been detailed in prior publications that have characterized the spatial-tuning of neurons using firing rate alone (Jacobs et al., 2010; Miller et al., 2015). Here, our primary analyses focused on how contextual information about navigational goals may be encoded based on firing rates and spike-LFP interactions. We implemented an automated algorithm to detect and exclude epochs of signal likely resulting from epileptic activity following prior work (Gelinas et al., 2016). We first low-pass filtered (fourth order Butterworth) the signal below 80 Hz to remove any spike-contamination at high frequencies. Epochs were marked for rejection if the envelope of the unfiltered signal was four standard deviations above the baseline or if the envelope of the 25–80 Hz bandpass filtered signal (after rectification) was four standard deviations above the baseline. In some cases, we noted short ‘bad data’ epochs lasting less than one second were not detected. We conservatively elected to exclude these epochs by marking any ‘good data’ epoch lasting less than one second as ‘bad’. Bad data epochs were excluded from all analyses. This algorithm identified and excluded ~5% (median across LFP channels) of data. Furthermore, the rate of excluded data did not differ between the LFP channels that did and did not contain phase-coding cells (rank-sum test, p=0.9). Numerous factors contribute to the presence and characteristics of band-limited neural oscillations, broadly including neuroanatomy, behavioral state, and recording equipment (Buzsáki et al., 2012). We developed an algorithm to adaptively detect and characterize neural oscillations in bands exceeding the background 1/f spectrum motivated by rodent studies that exclude periods of low amplitude theta oscillations when assessing phase coding (Lenck-Santini and Holmes, 2008). To this end, we modified the ‘frequency sliding’ algorithm (Cohen, 2014), which provides the instantaneous phase and frequency of oscillations in a band, in two important ways. First, rather than calculating frequency sliding in a priori bands, we defined bands for subsequent analysis on each electrode as those frequencies exceeding the background 1/f spectrum. We calculated power values in .5 Hz steps from 1 to 50 Hz using six cycle Morlet wavelet convolution. We then created a power spectrum by averaging values over time (and excluding bad data epochs), and fit a line to this spectrum in log-log space using robustfit in Matlab. Similar approaches have been used previously (Lega et al., 2012; Podvalny et al., 2015). Frequency band edges were defined as the lowest and highest frequencies in a contiguous set of frequencies that had values exceeding this fit; several bands could be detected on each electrode. We then calculated the instantaneous frequency and phase in each detected band using the ‘frequency sliding’ algorithm (Cohen, 2014). Second, frequency sliding provides a frequency and phase estimate at every moment in time, regardless of the presence or absence of an oscillation. We ensured that phase and frequency estimates were only obtained during time periods where there was increased power in the band of interest. We recomputed the power spectrum in 10s, non-overlapping windows and recomputed the fit line as described above. We excluded phase and frequency estimates at time points (1) in which the power was below the fit line or, (2) were during bad data epochs. Finally, we also excluded noisy frequency estimates outside of the band, which can occur based on ‘phase slips’ (Cohen, 2014). MODAL was implemented in Matlab using custom code that is available on Github (https://github.com/andrew-j-watrous/MODAL; copy archived at https://github.com/elifesciences-publications/MODAL). To assess how neuronal activity may vary during navigational planning and goal arrival, we split each delivery in half and operationalized the first half of each delivery as the planning period and the second half of each delivery as the arrival period. This approach has the advantage of creating equally sized temporal windows for analysis but does not allow us to draw firm conclusions regarding the precise temporal dynamics of navigational planning or goal arrival. We analyzed neural firing rate using a two-way ANOVA with factors of navigational goal and task period. Cells which exhibited main effects of goal or task period (defined as p<0.05 uncorrected) were considered significant. We used Rayleigh tests to identify phase-locked neural firing, extracting the phase of the LFP during each spike in each detected frequency band. All analyses were done considering each band separately and statistical thresholding was set at p<0.005 for each cell. This was chosen to be stricter than p<0.05 (Bonferroni-corrected) across the number of bands detected in the 1–10-Hz range. To control for the possibility that non-sinusoidal oscillations led to spurious phase-locking, we tested if the distribution of spike phases was different from the distribution of all phases on the LFP. 96% of phase-locked cells had a significantly different phase-preference to that of the entire LFP (p<0.05; Watson Williams test), suggesting that phase-locked activity was not a byproduct of non-sinusoidal oscillations. We used a decoding-based approach to identify phase coding, employing a linear decoder with fivefold cross-validation to predict the behavioral goal from the phase of the LFP during neural spiking. In each band detected by MODAL, we first computed the sine and cosine of the phase values before classification following previous work (Lopour et al., 2013; Watrous et al., 2015a). Chance performance varies across cells because we classified goal information associated with the LFP phase for each spike and the distribution of spikes across goals varied between cells. Similarly, circular statistics can be influenced by small sample sizes. We accounted for these issues using a permutation procedure, re-running our classification 500 times per cell using shuffled goal information (circshift in Matlab to maintain the temporal structure of the session) to get a surrogate distribution of classification accuracies per cell. We then obtained a p-value for classification by ranking our observed classification accuracy to the surrogate distribution; p-values less than .05 were considered significant. We additionally ruled out the possibility that our phase-decoding approach was biased to observe effects in more narrow oscillatory bands, finding no correlation between phase-decoding classifier accuracy and oscillatory bandwidth (rho = -0.008, p=0.85; see also Supplemental Materials). We then used the above decoding approach considering spikes in only the first half (planning) or second half (arrival) of each delivery to assess how phase coding varies by behavior. Each cell was categorized as phase coding during planning (p<0.05 with decoding approach), arrival (p<0.05), or both. We performed three analyses testing whether broader changes in the LFP, which may influence signal to noise ratio, may contribute to or confound our results. First, we correlated the phase-decoding classification accuracy in each band with the proportion of time oscillations were detected over the whole session. We did not observe a relation between the prevalence of oscillations and phase decoding (rho = −0.0049, p=0.9). Second, we performed an analysis testing whether phase-coding, measured by classification accuracy of our decoder, was related to the oscillatory bandwidth. We did not observe any relationship between the two measures (rho = −0.008, p=0.85), indicating that phase coding in the range we are considering (<10 Hz) is unrelated to bands with wider (possibly less stable) frequencies. Third, to determine if the prevalence of oscillations across goals could account for our phase coding results, we asked whether the prevalence of oscillatory bouts in each band varied by goal, focusing our analysis on channels where we observed phase coding cells. For each band between 1–10 Hz, we computed the prevalence of bouts for each goal. We assessed significant goal-related changes in bouts with chi-square tests, comparing the observed chi-square value to a surrogate distribution of values generated by shuffling goal information (n = 100 shuffles). We observed significant effects (p<0.05 shuffle corrected) in only 6.4% of cases which did not exceed chance levels (Binomial test, p=0.18). To determine how the present single-neuron results relate to our previous work (Watrous et al., 2015a), we tested whether (1) high frequency activity (HFA; 65–120 Hz) correlated with single-neuron spiking and (2) whether HFA demonstrated phase coding to low-frequency phase. First, excluding bad epochs and analyzing the entire recording session for each LFP with an associated single-neuron recording, we correlated z-scored HFA with a smoothed firing rate vector (500 ms kernel). We identified significant (shuffle-corrected p<0.01) positive correlations between HFA and single-neuron activity in 544/1311 (41%) of neurons. In contrast, negative correlations were only identified in 14 neurons. Second, to test whether the low-frequency phase when HFA events occurred correlated with goal state, we adapted our decoding framework to incorporate HFA events instead of spiking, using similar methods as our previous work (Watrous et al., 2015a). Briefly, for each channel we identified periods where the normalized HFA power exceeded z = 1.96 and labeled the center of each such period as an HFA ‘event’ (see Figure 2c in Watrous et al., 2015a). Each HFA event was then treated as if it were the timepoint of an action potential and used as the input to our main analysis of spike–phase coding. Using this approach, we found significant decoding using HFA events instead of spikes on 14% of channels (76/525), comparable to what we have previously reported (Watrous et al., 2015a). We then asked if the presence of HFA phase coding on a channel correlated with the existence of spike-phase coding on the same channel. However, we found that the presence of these two phenomena were unrelated across channels (χ2=0.01, p=0.9). Thus, while single-neuron firing is correlated with increases in HFA, both of which demonstrate phase coding, spike- and HFA-phase coding were not observed on the same channels. This counter-intuitive result may reflect a functional heterogeneity of information representation within the human MTL, whereby adjacent cells represent different types of information even as they contribute to the same LFP. This is similar to what has been observed in monkey orbitofrontal cortex regarding the differential information representation shown by single neurons compared to HFA (Rich and Wallis, 2017). The raw human single-neuron recordings can be obtained upon request from Joshua Jacobs. At this point, the data has not been made publicly available to ensure controlled access to the dataset and that the patient's anonymity is not compromised. Electroencephalography and Clinical Neurophysiology 25:309–318. The Journal of Neuroscience 21:1635–1644. Philosophical Transactions of the Royal Society B: Biological Sciences 369:20130304. Journal of Cognitive Neuroscience 29:507–519. Journal of Cognitive Neuroscience 19:479–492. Frontiers in Human Neuroscience 2:3. Frontiers in Systems Neuroscience 3:6. Frontiers in Human Neuroscience 8:75. Current Opinion in Neurobiology 31:33–39. Thank you for submitting your article "Phase-tuned neuronal firing encodes human contextual representations for navigational goals" for consideration by eLife. Your article has been reviewed by three peer reviewers, and the evaluation has been overseen by Timothy Behrens as the Senior and Reviewing Editor. The reviewers have opted to remain anonymous. Electrophysiological studies in the rodent hippocampus have provided compelling evidence for neural phase coding during spatial navigation. Such studies observe spiking activity to be coordinated with specific phases of locomotion related theta oscillations. Observing similar coding properties in the human medial temporal lobe is exceedingly difficult. In their manuscript, Watrous et al. attempt to address this challenging question by recording spiking and LFP activity in epilepsy patients, while performing a virtual navigation task. Naturally, these data are highly novel and of great utility in establishing evidence of spike-phase coding in the human brain. The study is a clear advance on the authors paper which reported the LFP data, as they are now able to report the relationship between spiking and LFP activities. The study also proposes new methodologies that, subject to some concerns below, will likely be very useful to the field. All told, the reviewers agreed that it is an exciting and strong study. There were many overlapping concerns amongst all three reviewers. I have tried to cluster them into themes where the reviewers are making overlapping points so that you find it easier to address the concerns together. You will see that although there was a consensus that the data are potentially extremely exciting, there was also a frustration that much of the data is hidden in the presentation, and that a number of technical issues need to be addressed. 1) As a general comment, much of the results presentation is without any reference to the experimental task conditions or the anatomical sites of recording. While I appreciate the authors are trying to be concise, it does seem that talk about 'neural coding' requires clear grounding in what is being coded and where. Is it the author's key prediction that specifically the hippocampus should display spike-phase coupling during navigational goal planning, as apposed to other task conditions? Is this motivated by rodent work? In a related comment, evidence for spike-phase coding would suggest a strong sensitivity to behavioral state, such that a critical test for the authors is comparing their analysis to different task periods, e.g. planning vs. navigation vs. arrival. These comparisons are important as the evidence shown for goal information coding is (despite looking large) a difference of ~1 spike between the preferred and non-preferred goals. 2) The link to behavior is unclear. No task description and behavioral readout is provided and the phase-coding theory could be epiphenomenal. This is particularly concerning given that most (93%) exhibit a very slow theta rhythm, which is unusual – even human studies often find theta around 6 Hz. 1) The authors introduce a new algorithm to separate oscillatory activity from 1/f fractal components. While this approach is timely and important, introducing a new algorithm requires some kind of validation that it actually works. MODAL seems to be a combination of 1/f slope fitting (e.g. like Gao and Voytek, NeuroImage) and the Cohen frequency sliding method and should be compared against established algorithms such as CGSA (coarse-grained spectral analyses, e.g. He 2010 Neuron) or IRASA (Wen and Liu 2016 BrainTopography and JNeuro). Reviewers agreed in discussion that it was important to validate the new algorithm. 2) The authors use a novel method for tracking the shifting frequency of oscillations. Is there evidence the authors can provide that supports phase-coding when the center frequency of an oscillation is unstable? In visual cortex, work by Xing et al. (2012) has argued that the variability in peak frequency and stochastic bursting nature of gamma oscillations greatly limits their coding ability. A similar critique may be applicable to the author's data. 3) The authors previously used HFA (high gamma) as a surrogate marker for spiking to demonstrate phase-coding in the MTL. Here they extend it to SUA. It would be of great interest to directly compare these metrics and to develop a better understanding how phase coding (at the population level) guides HFA, MUA and SUA. The authors could then test for how much variance is explained by theta alone (power and/or phase) as well as theta-HFA, theta-MUA and theta-SUA coupling. 4) It is unclear if there were any power differences in the theta band that might explain why some sites show more pronounced interactions. Differences in signal-to-noise could affect phase estimates. 5) Were LFPs and units extracted from the same or adjacent wires? Do the effects still hold true when the LFP is extracted from the most distal depth electrode? 6). Why was the frequency range limited to <10 Hz, which seems arbitrary given that the authors detected individual oscillations and e.g. work by the Miller group indicated a relevance of alpha/beta oscillations. 7) Was the seizure onset zone excluded or only epileptiform epochs? The Gelinas algorithm only detects sharp spikes, how did the authors deal with slowing? This could confound the 3 Hz range. 8) Was the theta oscillation sinusoidal (e.g. Cole and Voytek)? How did the authors deal with sites that had multiple low frequency peaks? 9) The difference score (DS) is not defined and it is unclear what this metric does. 1) The authors present a multitude of analyses and findings in only three figures and most analyses are not well described making it difficult to assess what was actually done. Figure 1 is merely a schematic to illustrate the oscillation detection method, Figure 2 shows summary data without providing any anatomical specificity and Figure 3 shows only a few single trial examples. Given that eLife does not have specific space constraints, a more careful and detailed presentation of the data would help to assess the findings. 2) Methods and results lack clarity. For example, the authors mention a decoding approach without providing any additional information on what was done or what the results were. From the description it would be impossible to replicate these analyses. 3) At several points in the Results there's a lack of specific details critical to interpretation. For example, in the last paragraph of the subsection “Phase-locked neuronal firing”, the authors mention 48 neurons that displayed two distinct oscillations. It's not clear where/why these 48 neurons are only mentioned, where they were recorded from, or what the two frequencies they are referring two. This is then followed by analysis that points to single subject data in Figure 2A, and a p-value without any reference to the test performed, and a claim of support for the SCERT model. As above, I think the author's attempt at concision has left out needed information for the reader. 4) The figures jump between data from different subjects (e.g. Figure 3) making it hard to follow an example finding across analyses for one subject, as an exemplar of the group data. Indeed much of the group data exist as p-values in text making it hard to get a sense for the effect size of the results and their across subject variability. 5) No waveforms are shown and it is unclear what kind of cells the authors isolated, how they were selected and grouped. Right now, it feels like a black-box approach and no information is provided to assess the data quality. 1) How did theta differ between PFC and MTL ROIs? Was there any interaction? 2) Frontal cortex results. The statement is made that "phase coding cells were not significantly clustered by brain region". This should be clarified – so this means phase-coding cells were found in frontal cortex? If so, how many and where? Were their properties different given that the emphasis here is on MTL theta, which wouldn't be present in the non-MTL recordings. 3) It would be of great interest to assess the relationship of evoked firing vs. ongoing activity. Would one observe a theta oscillation in a spike-triggered average or is some of the very slow theta (3 Hz) driven by the stimulus (spatial navigation) or saccadic/micro-saccadic eye movements, which occur at a similar frequency. As it stands, one cannot rule out that the observed effects are solely stimulus-induced. 4) What is the relationship between the "phase coding cells" (28/158) with the phase-locked cells (n=119) ? Are the 28 a subset of the 119? More broadly, I wonder whether cells that have a phase-code could qualify as phase locked using the definition used to identify the 119 cells, since these cells (by definition) have a single preferred phase. Phase modulated cells, however, change their phase preference as a function of task. This issue would benefit from clarification. 5) Only the cells that do not exhibit a rate code for navigational code were examined. Are there also cells that have both a rate and a phase code? 1) The Introduction and Discussion is too heavily focused on the "SCERT" theory – while this is certainly an interesting framework, many others have proposed similar ideas so the strong focus on this very recent "theory" is distracting and does not do the importance of this finding justice. This can be solved by more careful writing. For example, "it is unclear whether phase coding manifests in MTL neurons" is too broad of a claim, as demonstrated by the references that the authors already cite that show that MTL neurons prefer certain phases. 2) It would be helpful if the authors provide explicit predictions made by the SCERT model. I'm not sure it's clear what findings would refute their model, other than a null result of phase influence. For example, does the SCERT model make predictions about which frequencies should be influencing spiking? Or is it a more general claim that any oscillation is sufficient. Similarly, how does the model relate its framing of encoding/retrieval behavior to navigation, and specifically goal planning? 1) It would be helpful if the authors made clearer reference to the anatomical sites of recording during the presentation of data. Going through the results it is often unclear where units are coming from and if they are being pool across regions. 2) No anatomical information is provided on where probes were exactly located. 3) "Frontal cortex" is too broad of a term, given the very specific frontal areas that were recorded. Thank you for resubmitting your work entitled "Phase-tuned neuronal firing encodes human contextual representations for navigational goals" for further consideration at eLife. Your revised article has been favorably evaluated by Timothy Behrens (Senior and Reviewing Editor), and three reviewers. Thanks for the substantive revisions. We all agree that they have dramatically improved the paper, but there are a number of outstanding concerns from the reviewers. I am passing these on verbatim to avoid confusing matters. The authors have provided a thoughtful response to reviewer comments, including several new analyses. The addition of supporting text clarifies several prior uncertainties regarding task structure, anatomical specificity and group data. I have a few remaining comments. - The authors should qualify their reporting of phase-coding; it appears to occur in a small subset of cells, whose firing rates are sparse. Only ten percent of cells showed decodable goals from spiking phases, this should be more explicitly acknowledged throughout the manuscript. This statistic also needs to be clarified in relation to Figure 4C (caption is not clear). - Authors note they "…were able to test if the spike-LFP phase locking was specific to an individual frequency band or present for both bands". They then report 12.5% of cells showed "frequency-specific phase locking, showing phase-locked firing in only one LFP frequency band". But it's not clear what the split is between the two frequencies for this value, and if we should infer the remaining percentage is for locking to both frequencies or none? - The authors provide some benchmarking for the MODAL analysis technique, however, I would encourage them to pursue a separate publication of the method in the future, where the strengths and limits of the technique are rigorously quantified. - ANOVA results are not consistently reported with degrees of freedom and F statistic – presented in some cases and not in others. This needs to be harmonized throughout the manuscript. The authors addressed all concerns in great detail, however, in some cases their responses fall a bit short and a few more details would help. E.g. Technical concerns #1: applying their new algorithm to a different dataset does not constitute 'validating' it against a different established algorithm. Technical concerns #3: While the authors demonstrate a correlation between HFA and spiking, they do not show the more obvious (which their Discussion actually implies): Phase coding as observed by Watrous et al. (2015) in eLife based on the HFA can also be detected based on unit activity. While the authors imply a direct link, an empirical demonstration would be more convincing. In other words, do phase-locked HFA and phase-locked spikes both support phase coding, i.e. are they separate processes or do they constitute the exact same process? This point remains unclear. Technical concerns #5: Unfortunately, the authors state that they cannot access the macro data, which is puzzling per se, however, in many primate experiments (in particular on phase coding, e.g. Siegel et al., 2009), one typically uses phase and firing from adjacent and not the same wire. Technical concerns #6: It seems trivial to open the band-pass up to 30 Hz and not restrict it to 10 Hz. This would allow for a better assessment of the data – in particular, since the authors show a beta band oscillation in Figure 2. The authors prepared an extensive and detailed revision that addresses most of the concerns I had raised. The manuscript reads much better now, and is more straightforward to understand now for me. Beyond reproducing earlier findings, this manuscript shows two novel aspects: i) a novel theta-period detection algorithm is applied, which reveals 3-5Hz theta-frequency bouts in a number of human MTL and cortical areas. ii) it is shown that relative to these detected periods, a number of neurons phase-lock their spiking activity and the phase of this spiking activity is indicative of which goal is currently sought in a navigation task. 1) It is of some concern that the authors noted that it was not possible for them to know the seizure onset zone of the patients included. Having this information would have allowed to perform the critical control whether the same phenomena (phase locking and frequencies of detected theta periods) hold as a function of whether an electrode was inside vs. outside the seizure onset zone (i.e. to argue vs. the slowing). This information is typically easily accessible from the clinical record, so it is unclear why this was not done. Alternatively, perhaps this analysis could be done by using only neurons located on wires where the automatic "epileptic spike" algorithm did not have any hits? 2) The principle result is that for a subset of neurons, the phase of spikes is informative about the current navigation goal. It is further argued that for most such neurons, the firing rate was not informative about the current goal. However, I cannot see how it was excluded that what explains the differences in phase are aspects of the underlying LFP? i.e. the question is, for the neuron-LFP pairs for which the phase was indicative of the goal, was the LFP power used to define the phase also indicative of the goal? One argument the authors present to argue about this potential confound is to show that the number of detected oscillatory bouts does not correlate with whether a cell was phase coding (subsection “LFP-spike phase coding of goal information”). But it wasn't clear to me what exactly was measured here – please clarify. Why not specify for how many cells the detected nr bouts was indicative of the goal? It remains striking that the authors find that HFB and SUA are independently locked to the same theta rhythm, but are not correlated. This is surprising given their previous conclusions from Watrous (2015eLife) and no explanation for this finding is provided. Given that this is a direct follow-up submission, this should be discussed in more detail. In particular, given the results by Rich and Wallis (2017) and Watson (2017, European J Neurosci) it is concerning that the authors went through an elaborate analysis pipeline, which included the development of a new algorithm MODAL, to obtain these results, which are questionable if one assumes that HFB activity reflects MUA firing. What is the interpretation on the physiological level and how can this differential HFB and SUA coupling to the same theta rhythm come about? How would one reconcile these differences in terms of a mechanism? My remaining issues were addressed. We are pleased to hear enthusiasm for our manuscript. As described above, our brevity concerning data presentation was based on our earlier understanding of the format for a Research Advance in eLife. Now that we have been informed of the expanded length limit, we have added additional data and figures. For detail, see response to Presentation of data #1 below. We apologize for the lack of detail in our original manuscript. We have now added additional analyses to further clarify the behavioral and anatomical dependencies of our data. We have added an expanded behavioral component to the manuscript by assessing neural activity during planning and goal arrival periods. We also analyze rate and phase coding separately in different MTL and frontal brain areas. These analyses show that the hippocampus is involved in navigational planning using both a rate and a phase-coding scheme. We thank the reviewers for this helpful comment and now include an analysis which addresses the sensitivity of rate and phase coding to behavioral state. As suggested, we have added an analysis comparing phase coding during navigational planning and goal arrival. By performing this analysis, we now show that individual neurons are selectively responsive during these two task periods using rate coding (subsection “Behavior and neuronal firing during goal-directed navigational planning and arrival”) and phase coding (subsection “LFP-spike phase coding of goal information”). These findings are now described fully in the Results section and we have expanded the text regarding the behavioral relevance of our findings in the Discussion. We believe the reviewer point regarding ~1 spike difference between the preferred and non-preferred goals is a misunderstanding. Although the difference at the maximum preferred phase is ~1 spike in the example neuron, the distributions themselves are clustered at opposite phases and are thus distinct. As we now explain more thoroughly in our revised Materials and methods section, these distinctions are captured by our cross-validated decoding approach because it would likely not detect phase coding in the case of a 1-spike difference between two distributions. 2) The link to behavior is unclear. No task description and behavioral readout is provided and the phase-coding theory could be epiphenomenal. This is particularly concerning given that most (93%) exhibit a very slow theta rhythm, which is unusual – even human studies often find theta around 6 Hz. We are assuming the comment regarding 6-Hz theta is in reference to human neocortical or frontal midline theta detected with EEG or MEG. While the precise nature of the human hippocampal theta rhythm remains controversial, most invasive recording studies that have investigated human memory and navigation have identified two bands centered around 3 and 8Hz (Watrous et al., 2011; Watrous et al., 2013; Vass et al., 2016; Bohbot et al., 2017; Bush et al., 2017; Agajhan et al., 2018). These studies have found modulations of neural activity particularly in the slow-theta band (~3 Hz) as a function of behavior, arguing against an epiphenomenal or epilepsy-based account of our findings. We validated the MODAL algorithm to verify it was identifying oscillations correctly by running MODAL on rodent data and by verifying its output compared to visual inspection of raw traces. To this end, we now provide more raw data (Figure 4—figure supplements 1 and 2), which demonstrate slow theta in raw traces from the human hippocampus. We thank the reviewers for this comment, which encouraged us to validate our new algorithm. We elected to address this comment more directly by validating MODAL using rodent data, asking if MODAL can blindly detect rodent hippocampal theta, a canonical “gold standard” pattern in electrophysiology studies. We used a publicly available dataset of rodent recordings from medial prefrontal cortex and CA1 (Fujisawa et al., 2008; “pfc-2” dataset from crcns.org). As can be seen in the new figure (Figure 2—figure supplement 2), MODAL captured the 8Hz hippocampal theta rhythm and a slower and more variable rhythm in many frontal cortex channels.This analysis, coupled with visual inspection of raw traces (e.g. Figure 4—figure supplements 1 and 2) suggests that the slow theta that we observed in our human MTL recordings is not an artifact of MODAL. We appreciate this feedback and performed an analysis to assess this critique of shifting frequency of oscillations empirically. We performed an analysis testing whether phase-coding, measured by classification accuracy of our decoder, was related to the oscillatory bandwidth. We did not observe any relationship between the two measures (rho = -.008, p =.85), indicating that phase coding in the range we are considering (<10 Hz) is unrelated to bands with wider (possibly less stable) frequencies and have added this to the Materials and methods and Results sections. Similar to previous work, LFPs and units were extracted from the same microwire (Jacobs et al., 2007; Manning et al., 2009; Rutishauser et al., 2010; Nir et al., 2017). We unfortunately do not have access to the macro-electrode recordings and so we are unable to test how spikes relate to LFPs on the most distal macro depth electrode. 6) Why was the frequency range limited to <10 Hz, which seems arbitrary given that the authors detected individual oscillations and e.g. work by the Miller group indicated a relevance of alpha/beta oscillations. 8) Was the theta oscillation sinusoidal (e.g. Cole and Voytek)? How did the authors deal with sites that had multiple low frequency peaks? We have removed all mention of difference scores from the manuscript. Instead, we now use a cross-validated decoding based approach throughout the manuscript when discussing phase coding, which is more straightforward to understand and explains the same core scientific issue. - Added Figure 4—figure supplements 1 and 2 showing example raw traces and phase histograms for a phase coding neuron during goal arrival (1) and a rate and phase coding neuron (2). We have greatly expanded the relevant sections of text in the manuscript and have added several figures and now hope the reviewer will be satisfied with the level of detail which we provide. We identified rate coding in 11 of 12 patients and phase coding in the hippocampus of 9 patients and have added these details to the Results section. We now include example spike waveforms in Figure 1—figure supplement 1, provide information about spike sorting and anatomical groping in the Materials and methods section, and show example raw data in Figure 4—figure supplements 1 and 2. We now include the results of applying the MODAL algorithm for each of the 7 regions analyzed in this study in Figure 2—figure supplement 1. This analysis shows that ~3-Hz theta was observed on a similar proportion of channels in each brain area, thus confirming our focus on this range across our data. We have clarified this issue throughout the manuscript, and based on other feedback (see also Further analyses #5 below), we have modified our approach for identifying phase coding neurons. In our new analysis, we now characterize phase coding as a function of brain region and find that phase coding is most prominent in the hippocampus but also occurs in frontal areas (Figure 4C). We focused on MTL results because they were the most pronounced and because we had the strongest predictions in this brain area. As indicated by the reviewer, the phase coding we observe in frontal cortex is indeed likely related to frontal theta oscillations, as we did not investigate inter-areal phase synchronization or spike-field coherence (e.g. Voytek et al., 2015; Hyman et al., 2005; Benchenane et al., 2010) in this study. We believe this is an exciting avenue for future human studies. Given the continuous nature of our navigation task, we are a bit unclear as to what the reviewer is referring to here regarding evoked activity. Nonetheless, we have attempted to link our findings to behavior more carefully through analyses of neural activity related to navigational planning and goal arrival. As seen in Figure 2A, we do indeed see rhythmicity in the spike-triggered average of phase-locked cells. We have also observed such 3Hz oscillations in previous navigation datasets (Watrous et al., 2013; Hippocampus). As we did not record eye-movements, we are unable to tease apart changes in theta related to navigation versus eye movements. Based on this feedback, we have overhauled our analysis and now analyze rate coding and phase coding in all cells and then look for cells which show both types of effects (Figure 4C). There are indeed cells that show both rate and phase coding and we have included an example cell showing rate coding for Goal 3 and phase coding for Goal 1 showing this phenomenon in Figure 4—figure supplement 2. However, as can be seen in Figure 4C, most cells do not show both types of coding. We note that neurons which show both rate and phase coding are expected to be more rare based on the more stringent inclusion criteria (p<.05 for both rate and phase coding) and we therefore do not draw strong conclusions about the paucity of neurons showing rate and phase-coding. As suggested, we have broadened the Introduction and conclusion throughout the manuscript. We did not at all intend to imply that SCERT is the first or only model to posit phase coding, and owing to the expanded length limit we are now able to explain our view on this point in a more thorough fashion. We nonetheless still make a number of references to SCERT in the paper, which we feel is justified because the Research Advance format is designed to provide advances compared to a previous eLife paper. We apologize for the vague terminology and lack of reference to anatomical sites. Frontal recordings were primarily located in orbitofrontal, premotor, and medial prefrontal/cingulate cortex. We have refined our terminology to reflect this throughout the manuscript. We also explicitly reference the locations of exemplar responses in the main text of the manuscript instead of putting this information in the figure or caption. Finally, we have added a co-registered CT-MRI implantation image to Figure 1—figure supplement 1 which can help the reader understand the recording scheme. As requested, we have also clarified this information in the caption of Figure 4C. Please note that we have also fixed a small typo in this section, where we previously reported 48 cells it now correctly reads 44. Our conclusions remain the same. We agree with this suggestion and intend to write a separate methods manuscript on MODAL in the future. We have reviewed the text carefully and made edits to ensure our statistical reporting is fully consistent. We have changed the phrasing here and now refer to this testing as “benchmarking” the algorithm, which was the terminology suggested by reviewer 1. This new analysis addresses the reviewer’s concern by showing that spike and HFA phase coding do not constitute the exact same process. Nonetheless, more work is necessary to understand the spatial scale of different phase coding schemes in the brain and explain why some such patterns are visible in HFA signals. We think that any potential concern about artifactual results from measuring spikes and LFPs on the same channels is mitigated by our new analysis above (Technical concerns #3), which shows that our observation of spike phase coding on an individual neuron is uncorrelated with the presence of HFA phase coding on the same channel. This suggests it is unlikely that our results are a result of cross-frequency “spillover” as discussed in the Siegel et al. (2009) paper. We agree that it is unfortunate that we do not have access to the clinical records for these patients. However, we performed a new analysis to examine this issue, closely following the reviewer’s suggestion. 2) The principle result is that for a subset of neurons, the phase of spikes is informative about the current navigation goal. It is further argued that for most such neurons, the firing rate was not informative about the current goal. However, I cannot see how it was excluded that what explains the differences in phase are aspects of the underlying LFP? i.e. the question is, for the neuron-LFP pairs for which the phase was indicative of the goal, was the LFP power used to define the phase also indicative of the goal? One argument the authors present to argue about this potential confound is to show that the number of detected oscillatory bouts does not correlate with whether a cell was phase coding (subsection “LFP-spike phase coding of goal information”). But it wasn't clear to me what exactly was measured here – please clarify. The revised manuscript addresses the potential confounds associated with changes in power in two ways. First, the existing analysis, now clarified in the first paragraph of the subsection “Control Analyses”, tested whether the number of oscillatory bouts on a channel correlates with our ability to detect phase coding at that site. By showing no effect, we rule out a signal-to-noise confound. Second, in a new analysis described below, we ask whether goal states modulate the prevalence of oscillations, which may possibly give rise to our observation of phase coding. We also rule out this possibility. Together, these two analyses indicate that spike-LFP phase coding, rather than power changes in the LFP, is the strongest indicator of goal states in our recordings. Why not specify for how many cells the detected nr bouts was indicative of the goal? As suggested, we tested if the prevalence of oscillations varied by goal for the neurons that exhibited phase coding. However, we found that the number of neuron–band pairs that showed power changes for individual goals did not exceed chance levels (6.4%, 6/93 significant pairs, chance = 5%). We have included a reference to these new results in the Results section and fully describe the new analysis in the Control Analyses section. Notably, this observation is broadly consistent with our previous findings on power modulations related to goal states (Watrous et al., 2011). “Third, to determine if the prevalence of oscillations across goals could account for our phase coding results, we asked whether the prevalence of oscillatory bouts in each band varied by goal, focusing our analysis on channels where we observed phase coding cells. […] We observed significant effects (p<.05 shuffle corrected) in only 6.4% of cases which did not exceed chance levels (Binomial test, p =.18). It remains striking that the authors find that HFB and SUA are independently locked to the same theta rhythm, but are not correlated. This is surprising given their previous conclusions from Watrous (2015) and no explanation for this finding is provided. Given that this is a direct follow-up submission, this should be discussed in more detail. In particular, given the results by Rich and Wallis (2017) and Watson (2017, European J Neurosci) it is concerning that the authors went through an elaborate analysis pipeline, which included the development of a new algorithm MODAL, to obtain these results, which are questionable if one assumes that HFB activity reflects MUA firing. What is the interpretation on the physiological level and how can this differential HFB and SUA coupling to the same theta rhythm come about? How would one reconcile these differences in terms of a mechanism? 4) Channels with spike-phase coding are not correlated with those showing HFA-phase coding. We wish to thank the patients for their participation in this study. This work was supported by National Institutes of Health grants NS033221 and NS084017 (IF), MH061975, MH104606 (JJ), and National Science Foundation grants GRFP (SEQ) and BCS-1724243 (JJ). We also thank the editors and three anonymous reviewers for helpful feedback that greatly improved this manuscript. Human subjects: The Medical Institutional Review Board at the University of California-Los Angeles approved this study (IRB#10-000973) involving recordings from patients with drug-resistant epilepsy who provided informed consent to participate in research. © 2018, Watrous et al. Prior studies have shown that high-frequency activity (HFA) is modulated by the phase of low-frequency activity. This phenomenon of phase-amplitude coupling (PAC) is often interpreted as reflecting phase coding of neural representations, although evidence for this link is still lacking in humans. Here, we show that PAC indeed supports phase-dependent stimulus representations for categories. Six patients with medication-resistant epilepsy viewed images of faces, tools, houses, and scenes during simultaneous acquisition of intracranial recordings. Analyzing 167 electrodes, we observed PAC at 43% of electrodes. Further inspection of PAC revealed that category specific HFA modulations occurred at different phases and frequencies of the underlying low-frequency rhythm, permitting decoding of categorical information using the phase at which HFA events occurred. These results provide evidence for categorical phase-coded neural representations and are the first to show that PAC coincides with phase-dependent coding in the human brain.